extensive coverage. Peter Roof was hired to support the affiliate services provided by NBC NewsChannel. Requests came from around the world and as many as 27 crews were either provided or supported at their facility located two blocks from the US Capitol, site of the swearing-in ceremony. In the cold wind Roof helped setup ten live positions and supervised four paths on the street where he ran one camera. 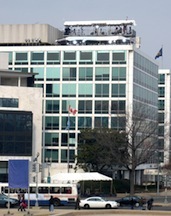 Six positions on the roof of the office building housing the NewsChannel DC bureau were on a shared, double-decked scaffolding erected for the first time for this occaision.